Will Hoge is a stripped back songwriter, comfortable with extracting deep from the heart and revealing his soul. Using his rather gruff and earthy vocals to maximum effect, he signs, seals and delivers the fruits of a craft honed over many years of practice. A slightly travel weary American, originally from Franklin, Tennessee but now introduced as a resident of Nashville, landed into the hinterland town of Milton Keynes to begin a new chapter of a career, characterised by plenty of endeavour punctuated with the odd big time break. 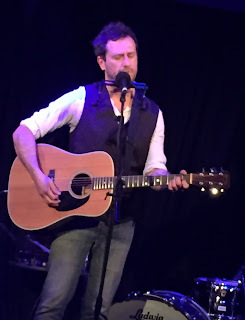 The Stables posted the sold out sign outside their studio-like second venue and a part enthusiastic – part respectful audience experienced the music of Will Hoge and his band at close quarters. This inaugural tour for Will was on the back of his acclaimed new album SMALL TOWN DREAMS, but this record is only a small part of an extensive back catalogue and far from dominated a performance spilt by the inevitable art centre interval. With a nod to the symmetrical, both sets were opened by Will in solo mode before being joined by the band. The presence of Will on acoustic rhythm guitar and occasional harmonica made this a five piece combo which perhaps took to the limit the sonic capacity of this confined location, probably suited more to a less full on sound. 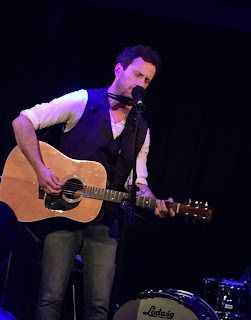 Whether you consider Milton Keynes as heartland UK, Will Hoge is absolutely the personification of heartland USA. As we learnt by the introduction to the song that 'feeds the kids', Will absorbed his inspiration from across the dial of the American soundtrack, whilst growing up in a town that more than shaped his outlook. The influence of the traditional country he listened to back then forms the backbone of his song writing style, in contrast the sound composition of drums, guitars and piano leans heavily in the rock direction. This leaves Will in the conundrum of where to market his music. Going back to 'that song', which Will exclaimed as ‘changing his life’, ‘Even If It Breaks My Heart’ was taken to country and radio heights by the version recorded by the Eli Young Band and proved that the winning formula existed within the arsenal of the songwriter’s repertoire. Following it up has been tricky for Will as well as stepping out of the shadows into the limelight of being a respected performer of similar stature to his acclaimed writing. The new album possesses many radio friendly moments should the powers that be choose to engage in Will’s style as we heard tonight in tracks such as ‘Desperate Times’, ‘Growing Up Around Here’ and ‘Better Than You’. Surprisingly album anthem ‘Middle of America’ was left off the set list, but more than made up by the poignant signature track from the record, ‘Little Bitty Dreams’. The new record is very much about Will telling the listener who he is and the audience tonight went home a little more informative about his passions, loves, nuances and driving influences. They also saw a tidy rock tinged band performance markedly improved in the second half when lead guitarist Patrick Stevens stepped up to make his solo contribution stand out more. The solid keyboard playing of Brady Beard held the tempo throughout the show, while the backroom team of bassist Dean Moore and drummer Brian Kilian played the essential but often unsung role of rhythm maestros. As previously mentioned, there is a cracked roughness to Will’s vocals which blend in perfectly with his heartfelt sentiment and they peaked in one of the show’s stand out moments, with every sinew of emotion packed into the blues-style belter ‘When I Get My Wings’. As intimated the show seemingly picked up intensity and pace during the second half, probably as a result of the band settling into their groove. A trio of songs that were previously unfamiliar made a profound impact in this segment of the show. ‘Another Song Nobody Will Hear’ summed up perfectly the frustrations of an aspiring songwriter and ‘Daddy Was a Gambling Man’ showed that Will was prepared to go straight to the bottom of the often forgotten vice. The third of these three tracks new to the ear acted as the show closer which surprisingly had the omission of an encore. Anyhow ‘The Highway’s Home’ was a suitable finale to send folks away happy. Banjo, fiddle and steel may be lacking in Will’s approach to music making, but the line ‘a head full of Hank Williams songs’ demonstrated a kind nod to tradition which was topped by all five band members stepping off mic to deliver a snippet of the Hank classic ‘I’m So Lonesome I Could Cry’. Across the hour and forty minute show, it was impossible not to warm to the style of Will Hoge and interpret what he stands for. Whatever mode of sound he chooses to accompany the message of his songs, he thrives on following instinct and breathing intensity into an accomplished performance. The level of Will’s success is ultimately out of his hands, but all he can do is stay true to his beliefs and continue to impress all those that connect with his music. I’m sure many folks in Milton Keynes did this evening.